This FREE event is sponsored by Shirley Coomer & Greg Stainton of Keller Williams Realty Sonoran living in Ahwatukee at the Monte Vista Elementary school located at 15221 S Ray Road in Phoenix. This is our 8th Free Shred-A-Thon event. We hold these each April and October in support of the Kyrene Resource Center and to give back to the community by offering FREE Shredding to help prevent identify theft. At this FREE event our Shred Truck, Compliments of ASDD Shredding will accept boxes or bags of papers to shred. 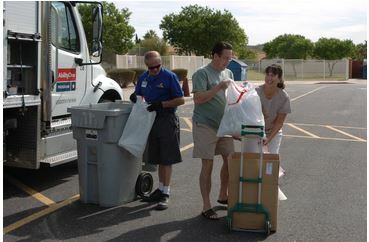 (okay to leave paper clips and staples in the paper to be shred) ASDD is owned by The Tempe Center for Habilitation (TCH) and the donated shred will be sold to benefit the TCH. When you bring in shred items we ask for food donation to the Kyrene Resource Center. Last November, the Kyrene Resource center provided 300 boxes for needy families with students enrolled in the Kyrene School district. This fall we are again asking for food items to be used for Thanksgiving Food boxes. (one food item for each box or bag shred). Last October we collected 700 pounds of food for the Thanksgiving food boxes. November 2014, the Kyrene Resource center provided 300 FREE boxes of Thanksgiving food for needy families with students enrolled in the Kyrene School district. In addition to the food box, families were given a Thanksgiving turkey. The picture to the right shows the Thanksgiving Box and Turkey distribution. 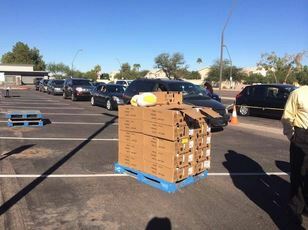 As you can see cars are lined up to receive their families’ Thanksgiving meal. the turkeys are stacked on the pallet for distribution to the families. Without this assistance many families would not have the traditional Thanksgiving dinner we all enjoy. You are asked to bring one food item per box/bag to be donated to the Kyrene Resource Center. We ask for a limit of 10 boxes or bags of items to be shred. If you have more items please call Shirley Coomer at Keller Williams Realty at 602.770.0643, as we can usually accommodate additional shredding. The Kyrene Resource center is supported by The Kyrene Foundation and provides services to families with students enrolled in the Kyrene School District. The Family Resource Center provides services to families in need of food, clothes, hygiene items and other seasonal help. There are almost 300 homeless children in the Kyrene district which includes parts of Tempe, Chandler and all of Ahwatukee. Homelessness is defined as families double bunked with other families, those who have lost a rental property or a home and are living in temporary housing, IE extended stay hotels or other short term housing. This free Shredding event is unique in that it has a ripple effect throughout multiple charitable groups benefiting the community we live it. As stated above, the food collected directly benefits the Kyrene Resource center which is supported by the Kyrene Foundation. 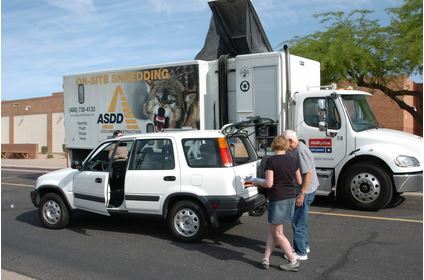 In addition, the Shred truck is donated by ASDD Document Destruction. ASDD Documentation Destruction of Tempe is owned by the Tempe Centers for Habilitation(TCH). The shredded paper is sold and the proceeds benefits the TCH provides services that support, care for and empower adults with developmental and physical disabilities. What a great way to support our community with services we all can use! Why is this Shred-A-Thon different from many others? Attendees can watch their papers being placed in a tub and then raised into the shred truck and destroyed. Unlike many other shredding events where you items may be trucked away you can watch documents being destroyed real time, and you can rest assured the shredding is complete before you drive away. Anther benefit is your shredded documents are mixed in with thousands of pounds of other shredded documents. We are grateful for the support of ASDD Document Destruction for this Shred-A-Thon. ASDD Document Destruction is a social enterprise of TCH – The Centers for Habilitation. TCH is a local Arizona 501 (c)(3) non-profit that has been operating since 1967. The TCH is dedicated to providing support and opportunities to people with physical and developmental disabilities. One of the ways TCH benefits individuals with disabilities is through providing jobs or job coaching and job placement. This is where ASDD Document Destruction comes into play. As a social enterprise of TCH, ASDD encompasses all of these roles. Their goal is to assist individuals with disabilities to obtain productive and valuable training and employment. The THC employees gain not only a paycheck but also skill training, independence, and dignity through their work. Moving those in our communities from dependence to independence is great for the community but more important, great for the individuals achieving a greater sense of freedom and self-esteem. At the October 2014 Shred-A-Thon event, 5,758 pounds of paper was shredded! This equates to saving 72 trees. Imagine keeping this paper out of the landfills. The shredding was sold to raise $430 for the benefit of the TCH. Kyrene School District Prevention Services Manager, Amanda Nosbisch stated that approximately 700 pounds of food was collected, which equates to $1120 in food value for the Resource center. Not only did people drive their trucks, cars and SUVs to Monte Vista Elementary school to have their papers shred, several local residences walked over to the event pulling their boxes or carts with items to shred! And…they brought food donations! Talk about being eco friendly! The Shred-A-Thon was started by Shirley Coomer of Keller Williams Realty as a result of learning some clients discovered some form of identity theft when applying for a home loan. Many people don’t routinely look at their credit until they are ready to apply for a home or car loan and may have no idea their identity has been comprised. When you have old bank statements or tax returns shred in a truck before your eyes you can rest assured your personal information remains private and your identity uncompressed. By partnering with the Kyrene Resource Center and asking for food donations the community is helping the center provide food to families vetted by the school staff in need of food assistance. While the economy in the Phoenix area has improved along with the housing market, there still remains a need in the community. While you find many multi-million homes in the area, many families are still struggling to make ends meet and the resources at the Kyrene Resource center are key to helping families with many basic needs, including food. When a holiday comes around, it is hard to explain to children there is no money for the traditional Thanksgiving dinner they are told everyone enjoys! This drive helps families participate in traditional Thanksgiving dinners. Rounding out the community support for this event are the youth from Desert Foothills United Methodist church. They help direct traffic into the school and ensure the lines move along to those bringing shred items and help collect the food and sort like items into boxes. Members of the Kyrene Foundation board also attended to help collect the food donations. At the end of the Shred-A-Thon, food is in boxes sorted according to the request of the Kyrene Resource Center to expedite the delivery and distribution of the food collected. As you can see it takes many hands to make this community Shred-A-Thon a huge success and the community support is greatly appreciated! Look for signs approaching Monte Vista Elementary school located at 15221 S Ray Road in Phoenix. We look forward to seeing you on Saturday October 24th between 9 and 11am! 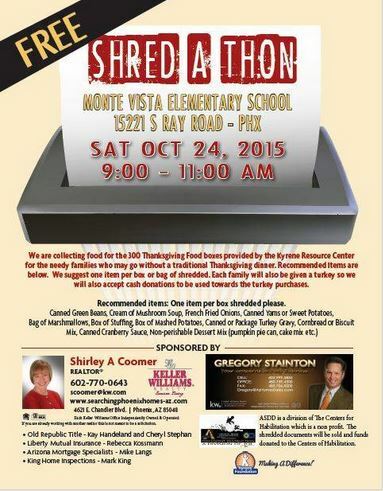 I hope you found the information about the upcoming Shred-a-thon Helpful. If I can be of assistance with your Real Estate needs anywhere in the Easy Valley area please call me at 602.770.0643. I have attached three links below. The first one will let you email me with any questions or comments.The second, will send you to the custom search area of my website to look at homes for sale in Ahwatukee / Mountain Park Ranch or the East Valley area. The last one will send you to the Home Value area of my website so you can see what your Home is worth Today.